The sleek and lightweight GN 2115 SoundTube™ headset model uses Acoustic Transmission Line (ATL) technology—the first significant advancement in voice tube technology and design. GN Netcom's ATL technology eliminates sound reverberations and distortions usually associated with plastic voice tubes. 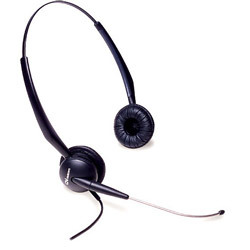 The GN Netcom 2115 headset is lightweight, very durable, and extremely comfortable, even if worn all day long. A click-stop headband provides a customized fit and pillow-soft ear cushions rest gently over the ear. This model is a binaural headset, with two earpieces which reduce background noise and make it easier to hear softer voices. The GN 2115 ST headset works on Direct Connect phones (such as Meridian Norstar business phones) as well as on standard phones with a GN 8000 amplifier.